The NZXT Phantom Full Tower Case that we are going to be taking a look at today claims to be an "Enthusiast Full Tower Case", but does it have what it takes to be "Enthusiast" quality? Today we are going to try and find out. There are tons of "Enthusiast" cases available on the market today but quite a few of them lack features that an "Enthusiast" demands. The NZXT Phantom has a long list of features to add to its truly unique design and I've been looking forward to getting a chance to take a closer look at this case for quite a while. The front and top panels of the NZXT Phantom feature quite a unique design and definitely are eye-catching and set it apart from other "square" cases on the market. 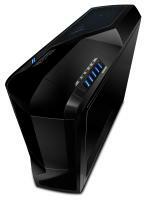 The NZXT is a big case and should be handle all of your hardware (and more). Cooling has been taken into consideration by NZXT for this case and thanks to the included 4 fans (with the option to add 3 more) airflow shouldn't be an issue. 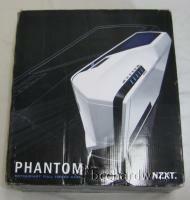 Let's take a closer look to see what the NZXT Phantom is all about. 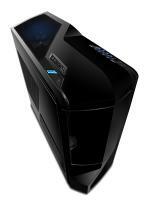 The NZXT Phantom case is pretty classy. It has some pretty aggressive styling that looks pretty cool without going overboard. While it is a steel-and-plastic chassis, it still looks pretty good and should appeal to a large audience. 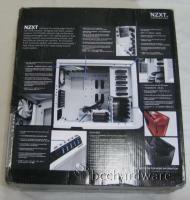 In the next set of pictures you'll see the packaging that the NZXT comes in. On the front of the box they show off the White Phantom case, but for our review we will be taking a look at the Black version (there is also a Red version available). I like the fact that this case comes in 3 different colors as not everyone is interested in getting a black case, I think both the Red and White versions look pretty neat and are both very eye-catching. 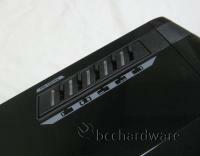 The top of the Phantom case is pretty well-unitized as the left side of the top panel features all of your power buttons, USB ports, headphone and mic ports, eSATA port and status lights. 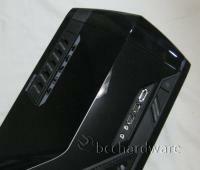 The right side features a built-in 5 channel fan controller that will allow you to control all of the fans in your case. This fan controller isn't a simple "On and Off" controller but actually lets you adjust the fan speed by sliding the dial for each channel. When fans are connected to a channel there is a blue status light that comes on to let you know which channels are hooked up. There is also a small picture beside each slider to let you know what fans you're adjusting. Overall I was quite impressed with this fan controller and anyone who loads this case up with fans will be very thankful for the ability to control the speed (and volume) of all the fans. Next we take a look at the side panels, which as you can see, feature more fans. Included with the NZXT Phantom are 2 120mm fans on the left side panel (which are also controlled by the built-in fan controller). In addition to the included fans on the left panel you also have the option to add another 200mm or 230mm fan (which blows directly onto the CPU area). The 2 fans that are included blow directly onto the hard drive bays (all 7 of the hard drive bays) which is a nice touch since some of these new hard drives have a tendency to run hot and the additional cooling is very welcome. The Right side of the case features a mesh which will allow the fans on the left side to blow air out of the case (which will probably be quite warm if you have a bunch of hard drives installed). Now we are going to take a look at the back of the case, which as you can see in the pictures features another included 120mm fan on the rear of the case. You also get dual-radiator support (thanks to the 4 holes in the back for tubing) if you want to pull off a huge water cooling setup. 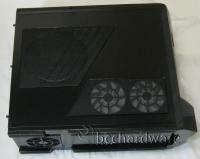 Like most cases these days the power supply is mounted at the bottom of the case. NZXT has included 5 of their premium cables which should help if your cables just aren't long enough to reach from the bottom of the case to all of your peripherals. 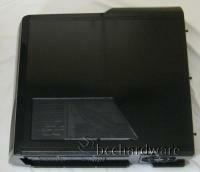 In the next set of pictures you'll see the bottom of the case allows for great airflow (pictured left). There is a filter below where the power supply is installed (which should prevent it sucking up carpet lint or other unwanted debris), and also underneath where the hard drives are located you've got mesh to allow for additional cooling. Also pictured (right) is a close-up look at the built-in fan controller.